I recently interviewed media artist Jennifer Steinkamp for Yale University Radio’s “The Lives of Artists". We talked about her work and recent exhibition “Blind Eye” at the Clark Institute. Jennifer’s video installations derive from images she draws and then animates using 3D animation technology. Listen to my interview with Jennifer Steinkamp. I recently interviewed media artist Refik Anadol, about his cutting edge work and fascinating artistic journey, for Yale Radio’s “The Lives of Artists". Listen to my interview with Refik Anadol. In 2016 I sat down with with sculptor Anthony Howe at his home on Orcas Island and we had an engaging discussion about his artistic jourmey and fantastic kinetic sculptures. Listen to my interview with Anthony Howe. The image of the rock face above is the 3rd face in my recent triptych Nā Kāhu Pōhaku (Rock Guardians). It is a mixed media piece based on images I photographed of faces in rock that I found, formed by erosion. This spot is one of the places I go to film the ocean. It can be very dangerous when large surf is breaking. I have witnessed some close calls, and even helped save a life by calling 911 to get help for a stranger who was swept out to sea on a day of very large surf (it was written about in the LA Times. She was airlifted by helicopter out of the water.) I’ve experienced a few close calls of my own, and I’ve lost all of my equipment to the ocean in this place for 10 years in a row, sometimes more than once in a year. Fortunately I did not lose any equipment this year, so I think I am learning! It can be treacherous on more than one level, the ocean is the most volatile hazard, and the sea spray on days of massive surf can make the rock extremely slippery - it is solid rock and very steep, a fall would result in broken bones at the very least. It is often very windy, which is another hazard that could easily cause a fall. Because of the remote nature of the place, I am usually alone. and occasionally a stranger shows up - I’ve experienced a few sketchy moments in that way as well. Fotunately I’ve escaped serious injury, though narrowly at times. I’ve begun a new series based on faces formed by erosion, in a rock cliff and the surrounding terrain, on Maui's north shore. The first piece in this series is a triptych of three faces, titled Nā Kāhu Pōhaku (Rock Guardians). The image above is the 2nd face in the triptych - you can see the first face in my previous blog, and I will be posting the third face in my next blog. I began each piece using a photograph of one of the rock formations, that I had printed on lithograph paper, which I then drew into with Prismacolor pencils. I shaded areas and used patterns (inspired by traditional Hawaiian kapa) to accent the face in the image, while allowing other areas to recede. As I worked on these, I began to notice animals and creatures as well as the main face. Pareidolia is the phenomenon of perceiving a recognizable image or meaningful pattern where none exists. These images are great examples of Pareidolia. If you look closely, you will see two pueo (owl), an ʻIʻiwi (Honeycreeper), a Night-Heron, two puhi (eel), a manō (shark), a dolphin and more. A few people have pointed out to me that the main face in this piece, brings to mind Kamapuaʻa, the Hawaiian shape shifting Pig God. Many of the animals that I began to see are various Nā ʻAumākua (Hawaiian ancestral guradian spirits). Interestingly, pōhaku (rock) is also considered to be an ʻAumākua. As my awareness of the faces in the rock became conscious, I felt something beyond Pareidolia (a phenomenon of the brain) as though a communication was happening, and a relationship forming. This place continues to reveal new facets to me and I now know it in a much deeper way. I often feel the sense of having entered a community of beings when in the presence of these rock formations. In Hawaiian mo'olelo (oral tradition) the northern most point of the island is considered to be a “jumping off” point for spirits in their transition to the afterworld. In the winter months I spend a great deal of time on Maui’s shoreline filming the ocean and tide pools when conditions are favorable. On days when the skies are clear, I head out in the morning and once I am set up, I often film for hours on end, sometimes until sunset. The sound of the ocean crashing and the dynamic nature of the phenomena surrounding me can be overwhelming. When large surf is breaking, a variety of things happen simultaneously, all drawing my attention - creating almost a panic within me. One remote spot I frequent on the north shore involves traversing down a steep cliff with my gear (tripod, camcorder, backpack and sketchbook) to get down to sea level, to the shelf below. After a number of years filming in that location countless times, one day I noticed a large face, formed by erosion, in the cliff wall. Over time, I began to notice more faces, some in the cliff and other 3 dimensional forms arising from the terrain. Eventually I began photographing the formations. A new body of work was germinating that lead to the series I have begun on pōhaku (rock). I recently completed the first piece in this series - a mixed media triptych titled Nā Kāhu Pōhaku (Rock Guardians) of three of the rock faces. The image above is the first of three faces in the triptych. If you look closely you will see a number of animals throughout the image. One example is the honu (sea turtle) to the lower left of the main face, but there are many more. 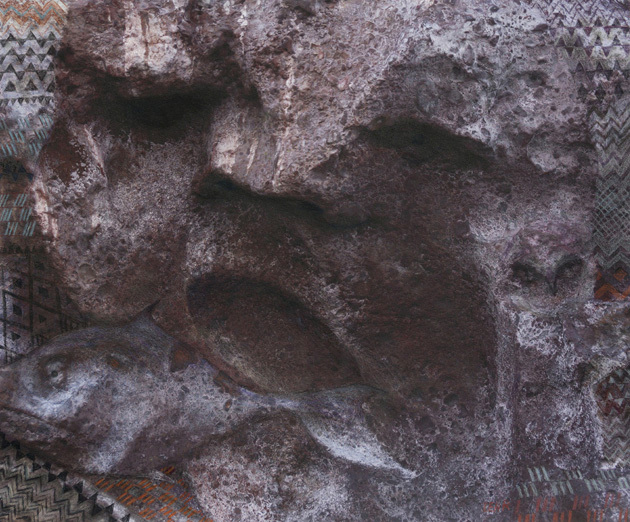 These lines are in the rock, I made subtle adjustments to draw attention to specific imagery, but I did not add lines to define the main face or creatures, Other than the geometric patterns inspired by traditional Hawaiian Kapa, I worked with what was already there. I recently arrived back on Maui where I spend winters. There are many subjects I will be working on this winter that span multiple islands here and I am grateful for the opportunity to be able to explore my subjects outdoors, over the winter. But it’s always a challenge to get back into the creative flow in the studio after being uprooted, packing and shipping all the unfinished works. Sometimes I will start some small pieces just to get the energy flowing like the pastel landscape above, of a cloud merging into a hillside at the cloud line, 7.5 by 11 inches. At noon last Sat, I went out to the peacock pen to feed my peacocks. When I walked into the pen, I saw a brown bird that looked like a chicken to my left. When it swiveled it’s head around, I saw that it was a Great Horned Owl, flapping against the wire mesh walls of the pen, trying to escape. I was able to get within a yard or two of it. Large gold eyes followed me, making direct eye contact, what a beautiful creature! I tried to figure out how to help it get out of the pen, but I was afraid if I tried to grab it, it might inflict serious injury, as it had formidable talons and a wicked beak. I pondered how to get the owl out of the pen without grabbing him (I believe it was a male, because of its size - male Great Horned owls are smaller than females). I decided to open a large door on one side of the pen and I walked out as I talked to the bird, demonstrating that it was a passage way out. When I walked back over to the owl, he swooped across to the other side of the pen where the door was open and out he went. Sadly, one of my peahens, mother to two adolescents, was face down in the grass, dead. I walked over to my dead peahen and discovered she had been decapitated and her head and neck eaten. I called a neighbor and learned that these owls can do this, even to large birds. I was not aware that an owl could be a predator to a bird as large as a peacock. I noticed one of my maie peacocks had a clump of feathers missing from his neck, so I think the owl tried to catch him as well, but he escaped. (Owl’s kill by crushing with the grip of their feet and talons). Mama peahen probably got in between him and her youngsters to protect them and put herself in the line of fire. My neighbor told me to pick up some crow or hawk decoys to put on top of the pen to deter them. I buried my peahen out behind the barn and planted an old fashioned apple tree sapling over her. That evening as I was thinking about the event, a dream I had the night before came back to me. In the dream I was looking out my window at my Catalpa tree, as it was getting darker outside, maybe around dusk. I noticed a Pileated woodpecker on a branch in the tree. As I looked at it I noticed there were more, maybe 4 all together. This seemed unusual. In the dream I excitedly pointed them out to a friend who was visiting me. As I continued looking, a Great Horned Owl swooped in to the shadows, under the canopy of the tree. This was most unusual as well, as I have never seen this before. I don’t recall ever dreaming about a Great Horned owl before, and I dreamt this on the same night the owl was in the pen. I recently had the honor and pleasure of interviewing James Turrell about his incomparable art for The Art World Demystified on Yale Radio. James shares how he got started, what motivates him and other fascinating details about his life and art: James Turrell interview. Below is the promo for a documentary on the life and work of my late father, Paul Lehr that I am involved with. It is still in production and is expected to be completed in late 2016 or sometime in 2017. Danny Miller is directing the film. THE VISIONARY WORLD OF PAUL LEHR is a landmark documentary that will explore the life of one of the most important science fiction artists of the 20th century. Featuring interviews with pioneering artists, filmmakers and illustrators of the science fiction art-form the documentary will celebrate the golden age of science fiction and reveal how Paul Lehr's work continues to influence film and art in the new century.